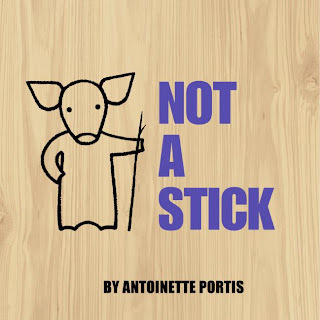 Antoinette Portis understands the minds of children. What could be more fascinating to a child than the most mundane objects. Why? Because they have the potential to be anything at all. In her first book, Not A Box, a little bunny has adventures in a cardboard box. Each time his parent questions why he would be playing in a box, he tells them simply "it's not a box". Then there is an illustration of what the bunny is imagining. First it's a racecar, then a mountain peak. It becomes many different things in the mind of the bunny and everything is fun and exciting. Finally he has to give it a name and he calls it his "Not-a-Box". The illustrations are simple line drawings that even leave some of the imagining up to the reader. It's got a fresh look with bright colors and the ability to get a child thinking out of the box, so to speak. Portis followed this book up with the similar Not A Stick. This one has a little different premise in that the parent is worried about the little piglet playing with the stick. But each time they say "be careful with the stick" or something similar, the piglet says "it's not a stick". This one is a bit more predictable with the stick being a sword, a fishing pole and other typical kid props. Still, it's his "not-a-stick" and he has infinite amounts of fun with it. Of course, with a five year old boy, I've experienced these books first hand and I love that it's something that Z can really relate to. He loved shouting out what each imaginary situation was. He also liked the simply drawn animals. After we read the book, we talked about some other things that a box or a stick could be. I loved this chance to turn our reading into a conversation and imagination session! These are great books for about three to six year olds. Support our site and buy Not a Box and Not a Stick on Amazon or find them at your local library. I'm definitely adding these to my list! My 4 year old will love them! LOVE these. I have them both and I don't even have kids. 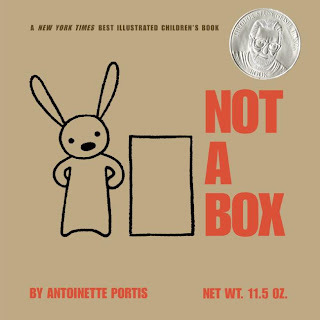 I loved 'Not a Box' as a sort of springboard for storytelling. Haven't seen 'Not a Stick' yet, but it's not hard to imagine. These remind me of a sort of entry-level 'Mysteries of Harris Burdick' which I spent hours with, sharing with kids and their parents back in my bookstore days as well as my own nephews. Tif - Yeah they will and you will like them too! Scott - Exactly what I liked - that it's not full of words and it lets kids imagine just like the character is imagining. I will have to check out the "The Mysteries of Harris Burdick"! I need to order these for the Grandboy! Thanks! Love the premises of both of these books! I'm amazed how my son makes ordinary objects into extraordinary ones all the time ... so these would be perfect for him! We could even write one ourselves... "Not A Finger." And if I haven't told you lately, your children's books reviews are just fantastic! Robin - I'm sure he will love them! Jenners - I love the idea of writing your own or even turning it into a game. And thanks! I love writing the children's book posts.